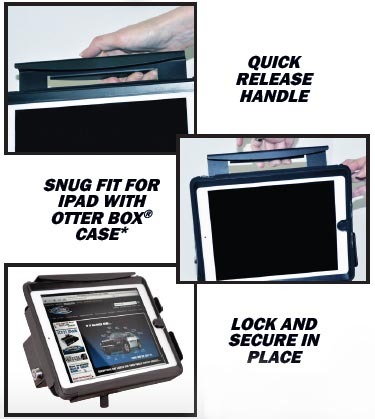 Designed to fit iPad and iPad2 when used with an Otter Box or Similar Case. Works with existing Jotto Desk Mounts! The NEW Kodiak Mobile iPad Mounting Station secures your Apple iPad / iPad 2 at your fingertips. This iPad mounting station is designed to hold an iPad with a protecive cover/case such as the "OtterBox" or similar case/cover with total dimensions not exceeding 7.75" x 10" x .785". The mounting station will secure the Apple iPad and iPad 2 from theft by using a barrel key securing system. The mounting station interfaces with a Jotto Desk laptop mount, allowing the iPad to be secured ergonomically. All iPad mounting stations are built according to ISO 9001-2008 standards, which means your iPad will be safely mounted while driving. For NEW Jotto Desk mount purchases WITH an iPad Desktop, you can exchange the standard ACD Laptop Desktop for the NEW iPad Mounting Station for an additional $165.00 when you get to the shopping cart! Order Part No. 450-0606 if you do not already have a Jotto Desk and wish to purchase one with an iPad / iPad 2 Mounting Station. Please order your vehicle's laptop mount and also order 450-0606 to EXCHANGE the desktop for the Mounting Station. $165.00. * PLEASE NOTE: This iPad mount will not work with iPads that do NOT have a protective case/cover. You will need to buy a protective case for your iPad. We do not sell such a product at this time.